Chia has become more of a household name these days (maybe not as popular as the infamous “chia pet”…yet). Chia pets were actually made from sprouting chia seeds. Here is a great step by step guide on how to sprout your chia seeds. For those of you looking for something fun to do with your chia seeds, try out this delectable pudding. It’s naturally sweet, savory and has a wild texture. 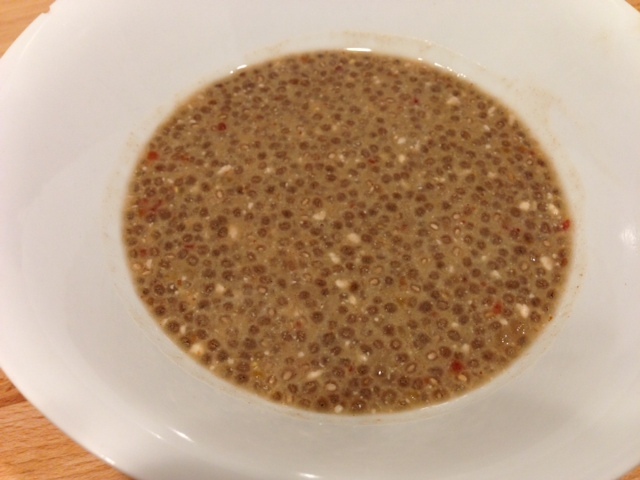 A perfect breakfast or snack, this pudding will provide you with omega 3’s, fiber, protein, antioxidants, minerals and will hydrate you since chia seeds absorb up to ten times their weight in water! 1. Prep and blend: In your blender or food processor add your coconut milk, water, dates, sesame seeds, vanilla and cinnamon. Blend until smooth. 2. Mix and store: Pour your liquid into two mason jars, add 1.5 tbsp of chia seeds in each. Twist on the lid, and shake it up. Place in your fridge for 20 minutes, then shake again. Yes, they are a funny little seed. It’s all about soaking them in a tasty milk, or in water that makes them stand out! Have fun with them!